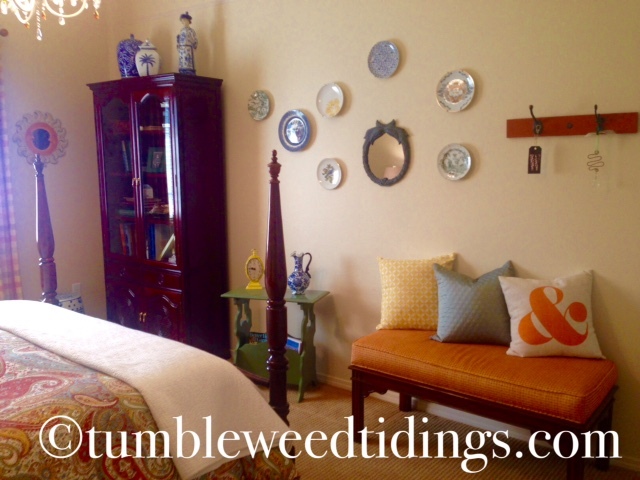 I’m so glad you dropped by Tumbleweed Tidings today! This has been a busy week around here getting the house somewhat ready for the change of season. My husband is draining down the pool, pulling out the remains of the garden, and installing the Styrofoam blocks in the crawl space air vents around the house. Meanwhile, I have been cleaning out the herb garden and flower pots, saving what I can for a while longer, as well as going through closets to collect treasures to donate to our church patio sale. We are leaving next week for a road trip to Colorado, so the clock is ticking to get things done, if you know what I mean. This morning, in an effort to use up our fresh food before we leave town, I have a large pot of butternut squash and carrot soup on the stove and a loaf of beer bread in the oven. It smells divine in here! I decided to title this post “Be Our Guest” because we are attending our local Academy of Children’s Theater (ACT) stage play of Beauty and the Beast this weekend, and Be Our Guest is one the songs from the original movie that I adore. I mean, how can you not love Angela Lansbury as a singing teapot? And Belle is my favorite Disney princess because she hits the princess trifecta; she’s a reader, speaks French, and is a little bit sassy! 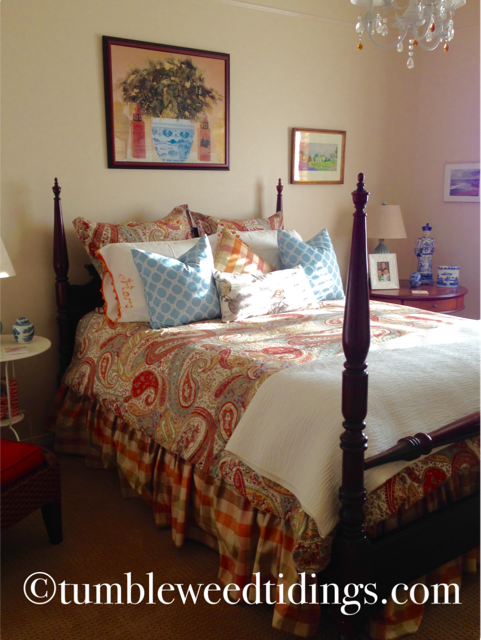 And, if those weren’t enough reasons, the most compelling one is that this post is about one of our guest rooms. 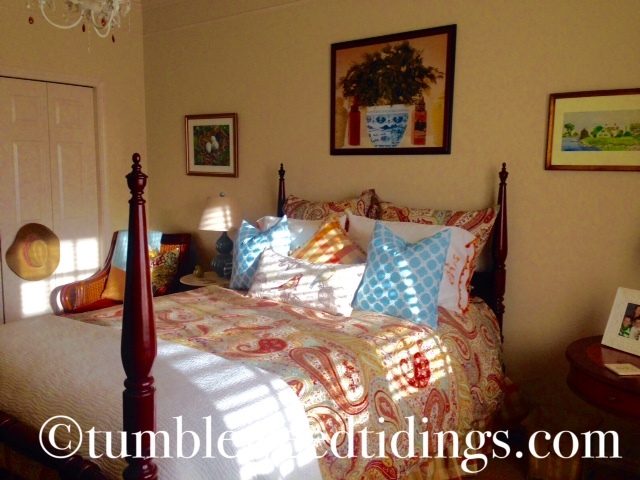 So today, the Home Tour continues with the Yellow Guest Room. When we moved into this home in late 2007, we were fresh off of 6 ½ years of living in Hawaii, and naturally had more than our fair share of tropical décor items. 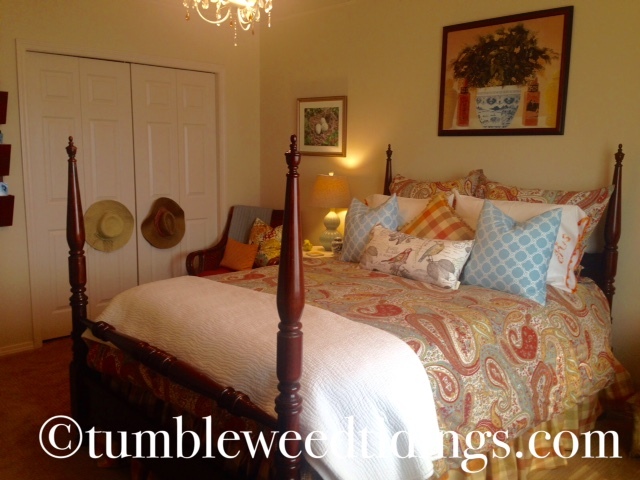 This bedroom quickly became the room where that theme was housed, and we called it the “Hawaii bedroom.” Over the past ten years, the tropical has slowly gone by the wayside and now we just call it the Yellow Bedroom. Not too imaginative, but it is the only bedroom in our house that faces east with the lovely morning sun, and it has the sunny colors to match throughout. I know many homeowners and decorators aren’t inclined to use much color these days, and wouldn’t touch orange with a ten foot pole. But I love color! It makes me happy and brightens up the dreariest of days, regardless of what the outside weather is doing. One of the things I love about this bedroom is that it shows how you can mix colors, solids and various patterns, as well as old and new items, and they can all play well together in perfect harmony. 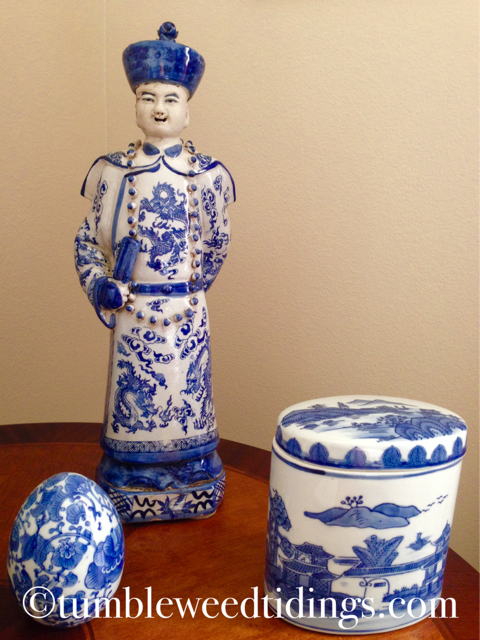 Lastly, I realize this is a lot more color and pattern than exists in the main living areas of our home. 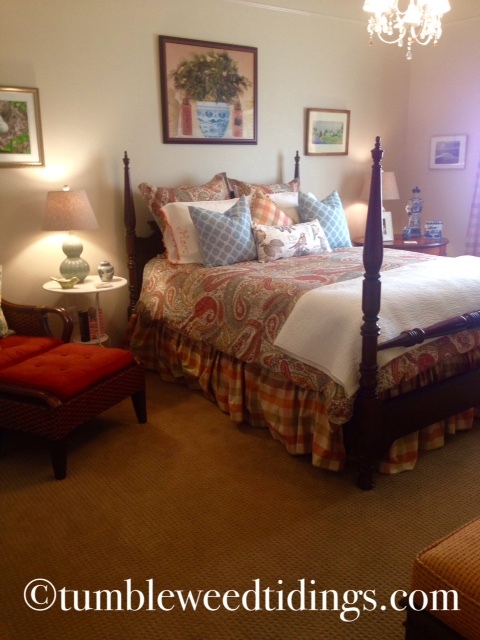 But this guest room can handle it. I mean, people are here for a good time, not a long time! The duvet cover and euro shams are a Jacobean paisley from Pottery Barn that were purchased about three or four years ago. I love the color options this print gives to pull from. There is blue, green, orange and yellow, tempered with a little white and even a little eggplant. Sometimes I use more white in the room, sometimes more green, and lately I have been using more of the blue. A print like this gives you options galore! 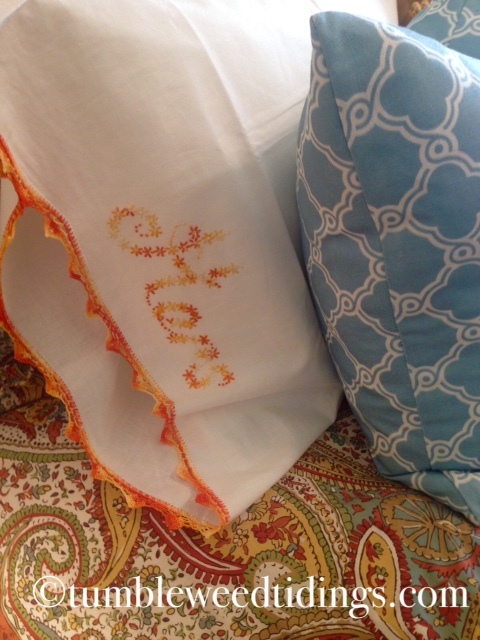 Several several years ago, my sister and I were in a little antique shop and I found these vintage pillowcases with His and Hers hand embroidered on them. They were in perfect condition and work so well in this room. 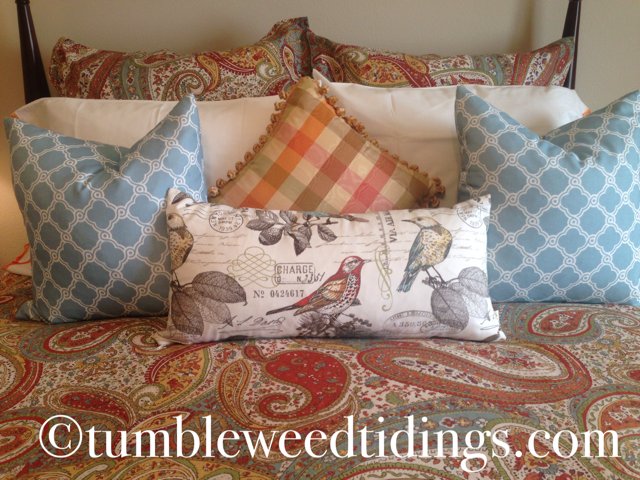 The white pillowcases and throw at the foot of the bed help to temper all of the pattern and colors a bit. 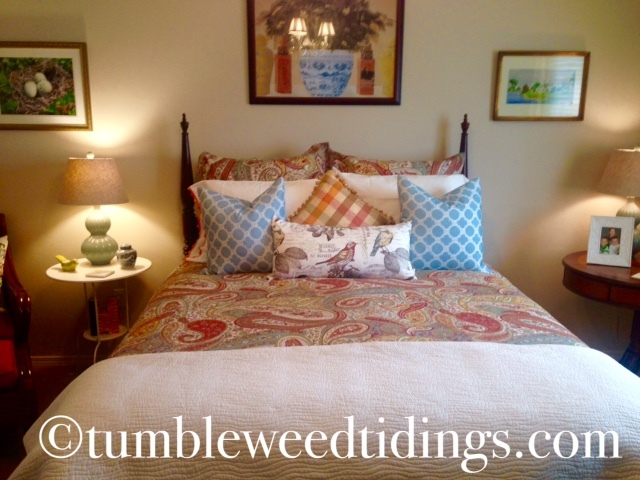 On the left of the bed is a white IKEA metal table with a Pier 1 rattan chair beside it, and of course, more pillows. The photograph of the nest and eggs was given to me by a dear friend from Hawaii, who not only worked for me in my store, but also sold her beautiful photos and notecards there. 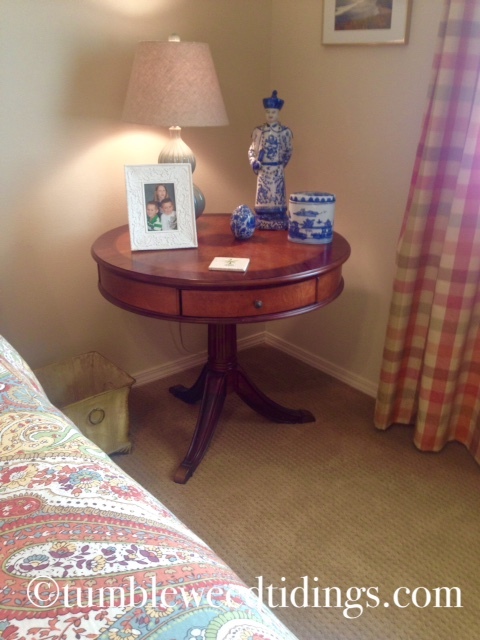 On the right side of the bed is a round table with some of my blue and white pottery, a lamp, and a picture of three of our nine grandchildren. Above the table is a cherished watercolor of my husband’s childhood home that he received when his parents passed away. On the window wall there is a photo of a seagull in flight over the water that my mother took. The wall across from the bed has a dark rosewood bookcase (a gift to my husband for his home office in Hawaii) which houses many of his engineering and nautical textbooks. The wall displays a random collection of blue and white plates that seems to grow weekly, a mirror and a rack with hooks. The bench covered in gold and orange fabric was a Thomasville glass topped coffee table, circa 1990. The glass was badly chipped during our ocean move, so my clever husband built a sturdy wooden top, and I took it to an upholsterer to make an attached cushion. It makes the perfect place to sit and put on your shoes or set a suitcase, and gets much more use than it did as a coffee table. I mean, how can you put pillows on a coffee table?! 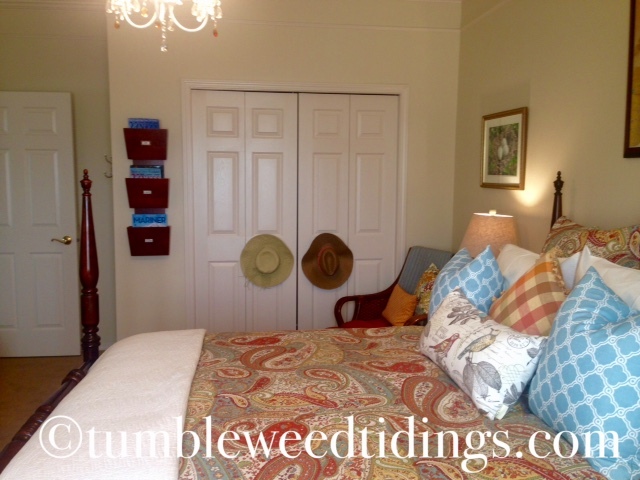 I hope you’ve enjoyed the Yellow Bedroom tour today! It is a sunny, colorful room full of vintage touches, photography and pictures that hold special meaning, and a very comfy bed. If you’re in the neighborhood, please stop by and Be Our Guest! Love it Diane. Sound like Jim is busy. Happy Fall! Thanks, Jeanie! Yes, he has his share of fall duties to put the yard and pool to bed. We both seem to keep busy, trying to live a full life. Happy fall to you, too! It is my favorite time of the year. I love how you mix patterns. Any guest would feel welcomed. Thank you! I’m not sure if it always goes together, but it is fun to try! This is a very pretty room. I enjoyed this very much. This is a very pretty room. I enjoyed seeing it. I’m glad you like it! 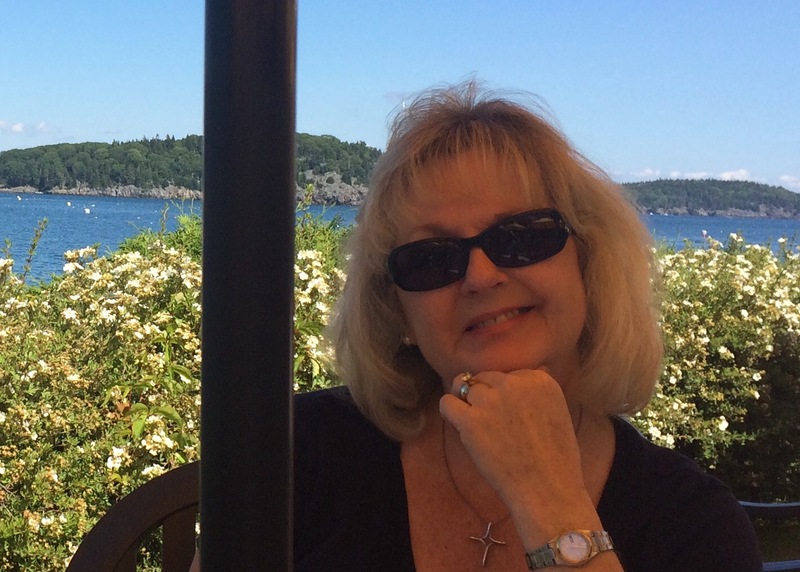 Thanks for following the blog!